War Grave Register notes: BELL., Lce. Cpl. Henry, 1378. 7th Australian Light Horse. 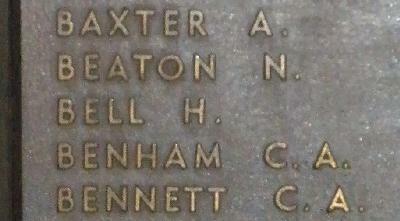 Died of wounds 6th Aug., 1916. B. 1. Miscellaneous details (Nominal Roll) Rank listed as Private on Nominal Roll. Taken on strength, 7th Light Horse Regiment, 28 December 1915. Appointed Lance Corporal, 7 April 1916. Mortally wounded, 5 August 1916.